MessagePro Campus offers you all the advantages of our encrypted messaging service and an alert button to notify all or a certain number of users about any emergency. It is a service focused on organizations with a large volume of users and which requires high synchronization between different locations, perfect for schools or campuses. Our schools have online portals to allow parents to access teachers and monitor student performance. However, texting offers easy outbound communications and reaches many more parents than email. It’s also great for time sensitive messages. We were reluctant to allow teachers to text students but with MessagePro we can instantly monitor texting activity and content. Our teachers appeciate keeping their personal cell phone numbers private. 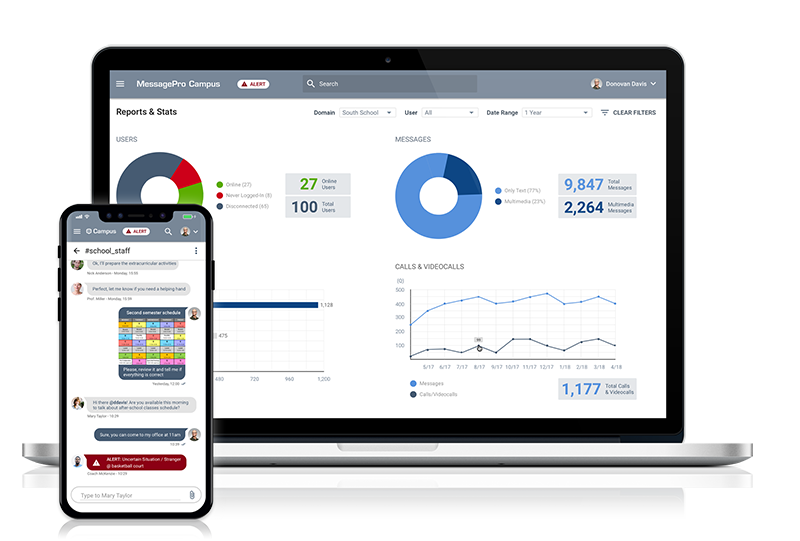 We also have our entire staff on MessagePro Campus, a secure messaging application that has great security features, including instant alerts to select staff members, or the entire staff in emergency situations . Highly recommended even if your school doesn’t use normal texting. Want to Know More About MessagePro for Schools & Campuses? Let’s Talk!